Libertyland was a theme park located in Memphis that ran from 1976 to 2005. It was more well known for its Zippin Pippin coaster and one fan in particular that would rent out the park for personal parties. 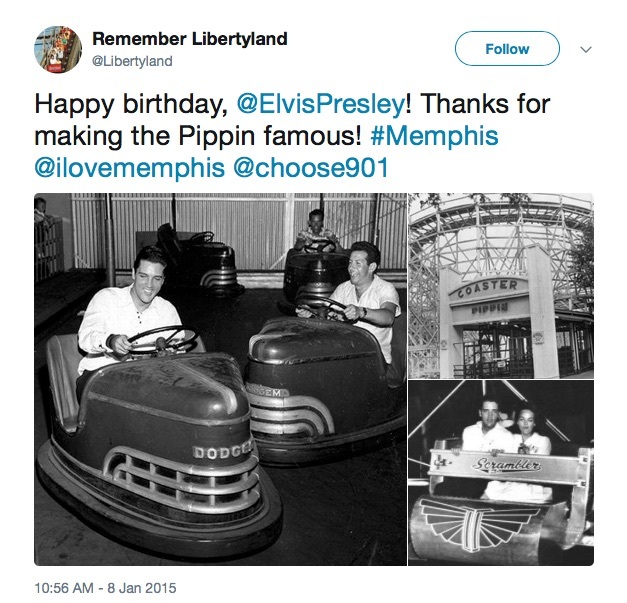 Yes, Elvis Presley was a fan of Liberyland and he loved the Zippin Pippin coaster. John R. Stevenson V, a coaster enthusiast, runs Coaster101 and he’s also a fellow Dollywood Insider. He reached out to me about reviewing his book on Libertyland and I was very excited to jump into it. I knew a little bit about Libertyland, but not enough. It’s obvious that John has done his homework. The Memphis amusement park was one of a handful of municipally-operated parks in the country, meaning that the city of Memphis ran it. Sadly, the park never was able to turn a profit or attract large crowds. It closed in 2005 with a whimper. Nope…doesn’t look like Elvis is riding the coaster incognito…or is he? But Libertyland lives on in full-color throughout the pages of John’s book. An abbreviated but full history of the parks is recounted. Like other parks that have closed, Libertyland is one that I wish I’d been able to visit. Especially when you read about the lineage of the group that designed the park; it’s very impressive. John’s book is a chronological look at the famed Memphis theme park, even looking at the earliest days of the Pippin (a 1923 coaster) and the Grand Carousel, which were both part of the Memphis fair. The book moves through the initial planning and construction showcasing the people behind the park. The first season was a celebration, that coincided with the nation’s bicentennial, and helped direct the future of the park. The book recounts the remaining 28 years through some wonderful photos and illustrative text. John even shares concept art for the park, which is very rare considering the size of the park. It’s still hard to imagine walking around the park, but John has painted a picture of a well-loved local park. 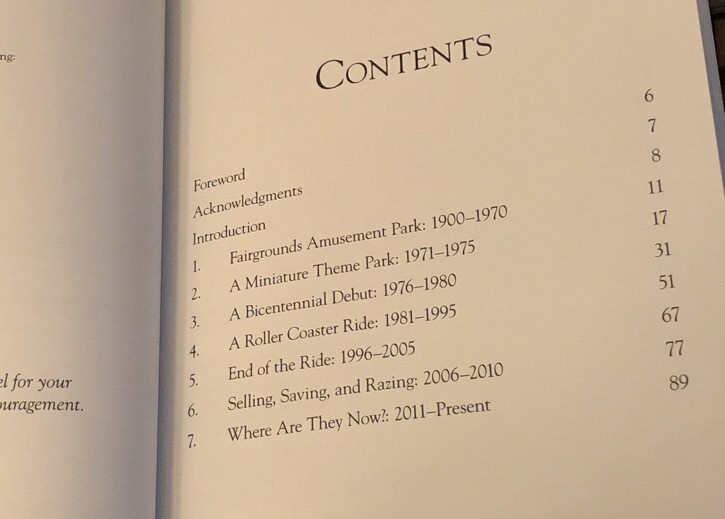 Anyone that fell in love with Libertyland is going to love this book, and be saddened that the park is gone. 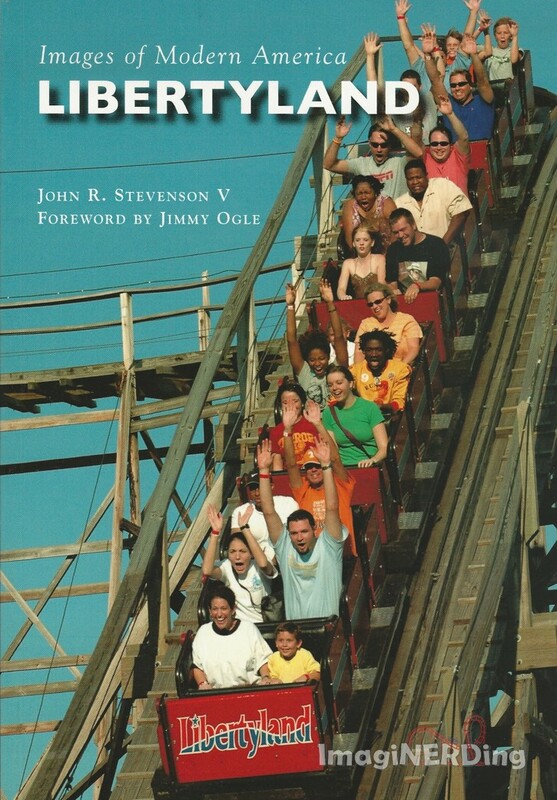 Amusement park fans should add the book to their collection because John has presented a well-documented look at a historically important park. John even coincides the work with a look at where you can find Libertyland today, and a one is very surprising. Are you a fan of Libertyland? Do you have a favorite memory of the Memphis park? Sneak Peek of Don Hahn’s Yesterday’s Tomorrow Book! George Explores Pandora: World of Avatar! Cant wait to read about this park. I never went but love theme parks!